Lexus Malaysia, a division of UMW Toyota Motor, had added the short-wheelbase version of the LS460 flagship to its line-up. Aimed at buyers who have a preference to drive themselves (rather than give the chauffeur the pleasure) and also require seating space for three behind, the LS460 (the long-wheelbase version has a L suffix) is shorter by 120 mm but looks just as well balanced in profile. For this generation of the LS model, L-Finesse design principles were adopted to present an image of dignity and quality as well as mastered creativity. The design conveys the sense of leading edge engineering and sophisticated technology with unparalleled refinement and an extraordinary simplicity of function. Subtle aggressiveness is evident in the styling and when viewed from the side, it can be seen that the profile evolved from the original Lexus slingshot shape with an arrowhead shape now adopted for the base of the front and rear pillars. Minimal body gaps, a low front grille and deep-drawn fenders all contribute to the car's distinctive, muscular profile. 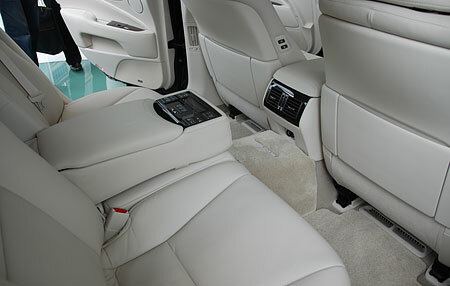 The details on the body of the LS460 are impressive. For example, the unique door moulding shape and portion of the radiator grille was created using an all-new zinc die-cast process which took Toyota many years to develop. Likewise, at the rear end, the dual tailpipes are integrated neatly into the lower section of the bumper and even the flow of exhaust gases is aerodynamically tuned. 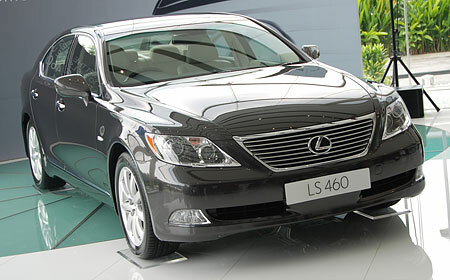 The headlamp design which has superior illumination and is one of the defining elements of the LS 460's appearance. The engineers wanted the projector-type xenon front lights to have thick-walled lenses with crystal-like properties. To understand better the properties of a "crystal" lens, the team made a headlamp lens out of crystal. Data was gathered on everything from transparency and the refractive index of light, to surface roughness. Based on the resulting data, a new lens was molded and hand-polished to reproduce the inherent look of crystal. 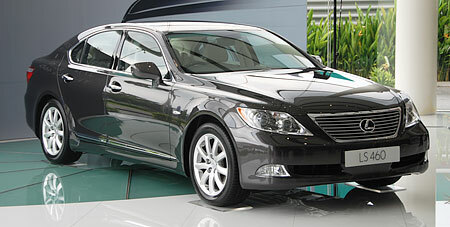 Like the LS460L, the LS460 also has a powerful and extremely refined V8 petrol engine with a 4.6-litre displacement. Producing 280 kW (380 bhp) and 492 Nm of torque, the engine has VVR-iE, a further advancement of the variable valve timing system (VVT-i) found in many Toyota engines. VVT-iE is said to have the world's first electric-motor driven variable valve timing mechanism with an electronically-controlled intake cam. The dual VVT-i combination of electrically controlled intake and hydraulically-controlled exhaust achieves superior engine-startup operation and high-output performance. When the LS460L was launched, it came with the worlds first 8-speed automatic transmission and the new LS460 also has this state-of-the-art transmission. With more gear ratios available, it is possible to maximize torque up to the tyre-grip limitations in the lower ranges yet maintain quietness and impressive fuel efficiency at higher cruising speeds. The sophisticated transmission-control system, known as the Driving Response & Acceleration Management System, is customized to match the characteristics of the engine and allows simultaneous release and engagement of the clutches to negate gearshift shock. When desired, the driver can also shift manually in a sequential mode. The LS460 platform has been engineered to maintain a delicate balance between ride comfort and responsive handling, accomplished via a production-control network that can trace the precision of the body and sub-assembly based on the design data. Aluminium is used for some parts of the suspension not only to save weight but also for rigidity. A front and rear multi-link suspension system with superior adaptability to unevenness in road surfaces is used on the LS460. The system is so well engineered that it maintains a stable vehicle posture in virtually all conditions, and even when braking hard, the LS460 can maintain its flat attitude due to the elimination of squatting and rising of the rear end. 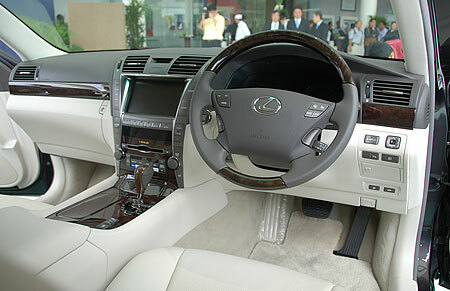 Like the LS460L, the LS460 also uses Electric Power Steering (EPS). This incorporates a large output brushless DC motor with improved precision of the reduction gear, increased motor-driving voltage and efficiency of the controller. It offers a smooth steering feel that supports the adoption of the multi-link suspension and large-diameter tyres. The EPS motor power was increased to create a steering feel that responds to the driver's touch and provides a responsive feel when cornering. The turning radius is 5.4 metres, which make parking and manoeuvring easy. In the safety department, the LS460 is right up there with the best when it comes to technologically advanced features. Most of these are part of the Lexus Vehicle Dynamics Integrated Management (VDIM) system which integrates and manages a host of handling technologies more quickly than other dynamic handling technologies. An important component of VDIM is the "brake-by-wire" system which translates brake pedal pressure into electric signals that, via computer control, help provide precise and optimized braking on virtually any surface condition. Electronic control provides quick brake response when needed, helping the VDIM system to anticipate and help correct slides before they might occur. The system is backed by conventional hydraulic brake control in case of the unlikely event of electronic failure. As with all Lexus models, ABS is standard along with Brake Assist and Electronic Brakeforce Distribution, along with Traction Control and Vehicle Stability Control (VSC). The latter system is also one of the elements in VDIM and works very quickly to restore stability and driver control, minimising the risk of an accident. Also present is the advanced Adaptive Front Lighting System which allows both the headlight units to swivel in the direction of a turn (at low speed, eg during turns at junctions, only one side will swivel). The bi-xenon lighting units produce illumination similar to natural sunlight and with their crystal reflectors, they can light up the road by as much as 18 metres more than the previous generations headlights. 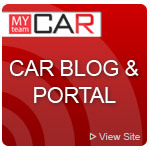 The LS460 also has a Back Monitor system which employs a tiny camera mounted above the rear numberplate to provide a view of the area directly behind the car whenever reverse gear is engaged. 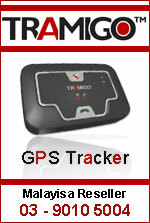 The image is displayed on the monitor screen on the dashboard so the driver will be able to spot obstacles or even small children. 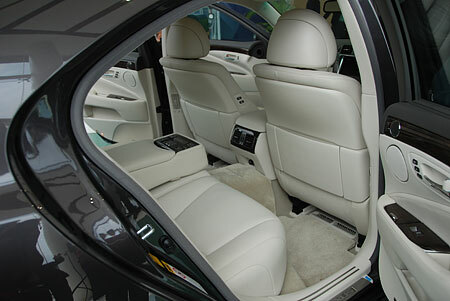 The five occupants of the LS460 are protected by various airbag systems. For the two front occupants, there are frontal airbags, side airbags, curtain airbags (over the windows) and also knee airbags, while the rear passengers also have side airbags, curtain airbags and seat cushion airbags. The airbag for the front passenger has a special twin-chamber design to better more effectively disperse the load on the passengers head and shoulders. To keep the driver fully informed of the cars functions, a Multi Info Display (MID) is located on a TFT screen between the tachometer and speedometer for immediate viewing. Apart from providing real-time information, the MID also provides recommendations to the driver for handling emergencies. The well-known Optitron meters have a new look with metal-toned rims and painted dials which give a 3-dimensional appearance. Using an electro-chromic system, the calibrations of the meters are especially clear and sharp on the TFT liquid crystal screen, reducing eye fatigue. An important factor during travelling is the climate inside the car and for the LS460, there is a sophisticated Multi Zone Climate Control system which can automatically adjust the temperature and airflow separately for four seating positions. By diffusing the airflow in multiple directions, the occupants do not have air blowing directly onto them, reducing the incidence of dry eyes and skin or other facial discomfort. Its something thats hard to explain and can only be understood when you experience it! Like other Lexus models, the LS460 has an audio system developed by Mark Levinson, one of the most respected names in high-end audio systems. No less than 19 speakers are fitted around the cabin to give concert hall ambience from a variety of sound sources - CD player (with 6-disc in-dash DVD changer) or a high-quality AM/FM radio receiver. In the middle of the dashboard is the Electronic Multi Vision which displays various information on the air-conditioner, audio settings, etc as well as DVD movies. So far, the RM665,000 (without insurance) LS460 has one customer waiting and according to sales people at Lexus Malaysia, there is interest in this new variant. 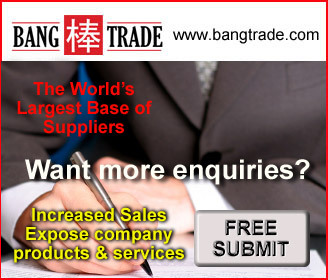 However, those who order now will have to wait till October when the next shipment of cars arrives in Malaysia.